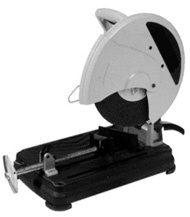 These blades are intended for use on table mounted saws like the one in the picture below. They are not suitable for use on belt driven saws. For belt driven saws use the blades under the 12"-20" tab at left. 915007 and 915012 are internal reinforced for smooth cutting. 915023 is external reinforced for cutting metal wall studs.